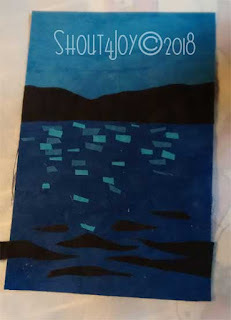 I had a great plan for this challenge - I was going to do a quilt that would meet two challenges. 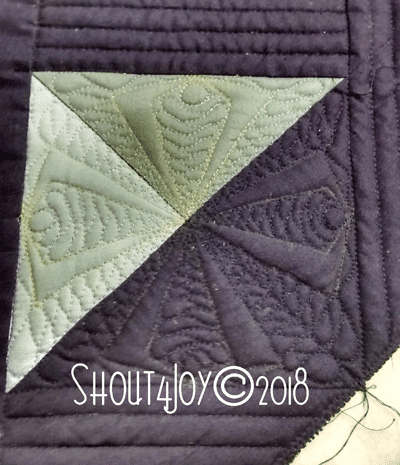 Of course, I didn't have enough time in my week to really get this quilt done to the level I could call it done, I had to work and I also volunteer with homeschool kids on Thursday afternoons and Friday mornings ... so the first idea, a modern quilt with triangles is only partially done. The top is pieced, I marked my quilting lines with the ubiquitous blue painter's tape, and started quilting. The problem is, it needs detail quilting ... setting off those lovely triangles and that detail quilting takes time ... a lot of time. So, at work on Saturday, I realized I had a perfect little project I could do during the evening. 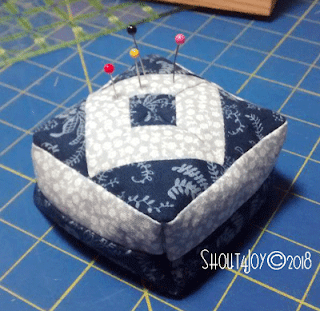 I made a pincushion! I started with 4 HSTs and, since they were kind of blah, I added another triangle to each HST. 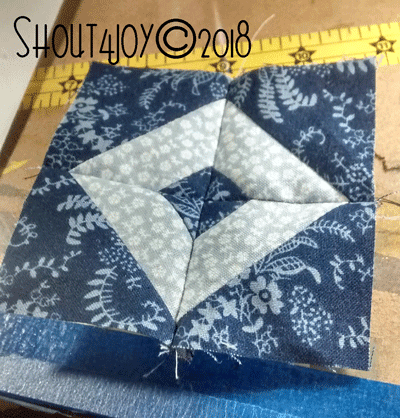 I placed the HSTs in a diamond configuration and built my little pincushion around the diamond. The pincushion is 3" square and 1 1/2" tall. It is filled with crushed walnut shells. Check out the other quilter's projects on the Project Quilting post. I carved out a little bit of time and made a little bit of a quilt. 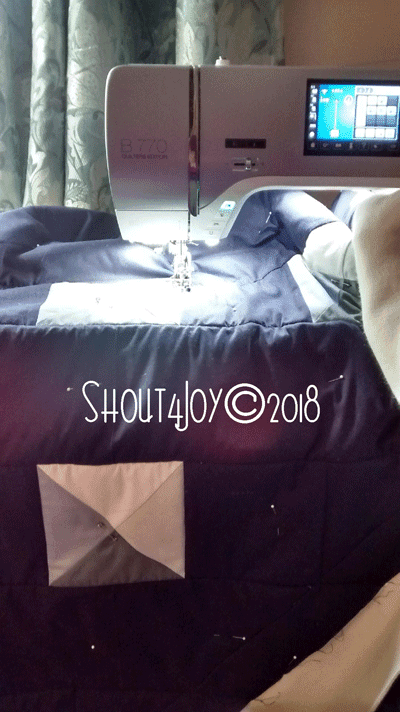 The theme for Project Quilting's first challenge of Season 9 is "Home Town Proud" and since I have lived many places, how do I pick a Home Town? I thought about Cadillac, MI as we spent quite a few years there, I graduated from high school while living there, I got married there, our first two children were born there ... but we haven't lived there for over 24 years. SO, I decided to go with the town I live in - Muskegon, MI. I have to say, living near the big lake - Lake Michigan - is always an inspiration with so many possibilities for creativity! 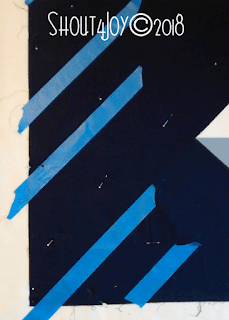 I decided to piggy-back this challenge with an upcoming event in town, the Muskegon Museum of Art's Postcard Salon. This is a fundraiser event every year and I thought it would be a great idea to combine the two in this challenge, so I made a postcard sized quilt! I started much bigger than I needed to as I forgot to double check my dimensions and made it large enough for a 5X7 card, but needed only 4X6. Working in a way that is very similar to my Cherrywood VanGogh Challenge piece, I started adding the highlights on the water and built from there. 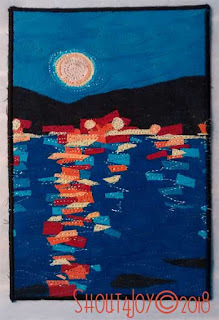 In fact, all but one of the fabrics is from Cherrywood Fabrics ... the moon is a batik. 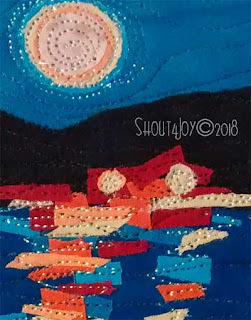 I quilted the piece first with a translucent thread called Glitter from Superior Threads, this produced some shine in the water, on the lights and on the moon. I used YLI Wonder Invisible Thread Smoke for the rest of the quilting, giving the textural movement needed for this serene scene. 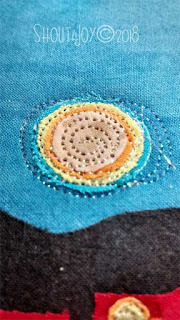 I finished it off with a satin-stitched border in black. 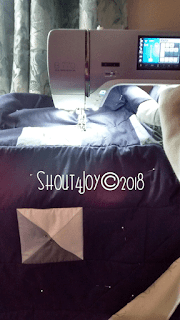 My Bernina does such a nice satin stitch!